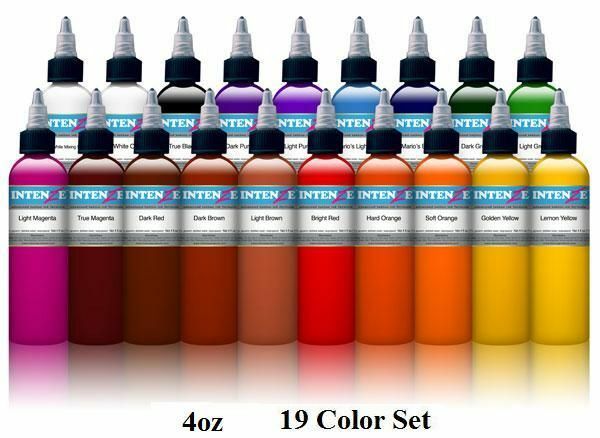 This is the Intenze Basic Color Set with 19, 4oz bottles of the basic colors you'll need to get started. This listing is for 19 bottles of 4oz colors from the Starter Series. The colors include: Light Brown, Dark Brown, Dark Green, Light Green, Mario's Blue, Mario's Light Blue, Dark Purple, Light Purple, Ture Magenta, True Black, White Opaque, White Mixing, Lemon Yellow, Golden Yellow, Hard Orange, Soft Orange, Bright Red, Dark Red, and Light Magenta.